Hollywood is certainly known for its famous attractions. 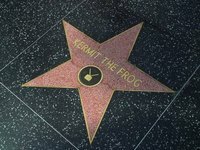 And chief among them is the Walk of Fame, where countless celebrities from the earliest days of show biz until the present have had their names forever emblazoned on a sidewalk star. The idea for the stars originated within the Hollywood Chamber of Commerce in 1953, and the first star was laid in 1960. They have been cultural icons ever since. Making your own version is a great way to feel like a star yourself, or it can serve as a gift to that aspiring actor in your life. Cut the black poster board so that it is in the shape of a square. Next, cut the white poster board into the shape of a star that will fit inside of your square. Draw the outline of your name in upper case letters, with a small design underneath in pencil on the white star. The design you choose should be something simple that describes yourself, such as a music note, television, camera, paintbrush or something else to personalize your star. Using the paintbrush, fill in your name, the design, and the outline of the star with glue. Next, sprinkle on the gold glitter and set aside to dry. You can also use some of the black glitter to embellish your design if you choose. Once the gold glitter has set, use the same glue method to fill in the rest of the star with the pink glitter and set this aside to dry. Place your star in the center of the black poster board and glue it in place. Next, mix the black and silver glitter, and use it to cover all areas of the black board that are left showing. Let your star dry overnight. Frame your Hollywood star for a unique wall hanging in your home. Use pink poster board instead of white if you don't want to cover the entire thing with glitter. Use glitter glue to write the letters out to save time and mess. Glitter can be hazardous to small children and should be used under close supervision.